(HealthDay News) -- Fruit and vegetable intake is associated with hip fracture, with a higher rate of hip fracture for intake below five servings/day, according to a study published in the June issue of the Journal of Bone and Mineral Research. Liisa Byberg, Ph.D., from Uppsala University in Sweden, and colleagues examined the dose-response association between habitual fruit and vegetable intake and hip fracture in a cohort study involving 40,644 men and 34,947 women (age 45 to 83 years), free from cardiovascular disease and cancer. Participants were followed for a mean of 14.2 years. 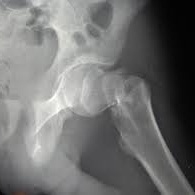 The researchers observed 3,644 hip fractures (62 percent in women) during 1,037,645 person-years. There was a strong nonlinear dose-response association (P < 0.001). Compared with those consuming more than five servings/day, men and women with zero consumption had an 88 percent higher rate of hip fracture (adjusted hazard ratio, 1.88). With higher intake of fruit and vegetables, the rate was gradually lower (adjusted hazard ratio, 1.35 for one versus five servings/day). The hazard ratio was no lower for more than five servings/day (adjusted hazard ratio for eight versus five servings/day, 0.96; 95 percent confidence interval, 0.90 to 1.03). The results were similar when men and women were analyzed separately. "There is a dose-response association between fruit and vegetable intake and hip fracture such that an intake below the recommended five servings/day confers higher rates of hip fracture," the authors write.